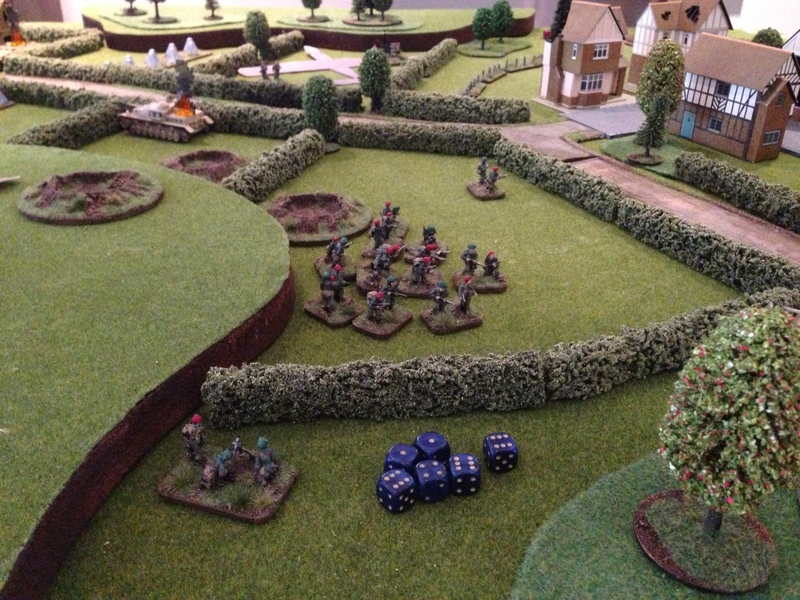 Or … A Bocage too Far! In a somewhat fortunate but at the same time unfortunate series of events, most of the Paras parachuted in close to each other with the 3″ mortar team landing on the other side of the bocage. On the hill to the left the rest of the paras landed with one of the gliders – the gliders containing Royal Engineers. The other glider can be seen having landed over in a field on the other side of the battlefield. There were casualties from the rough glider landings with 60% of the engineers rendered hors de combat whilst the jeep that was the transport for the 6-pdr anti-tank gun in the other glider was also knocked out of action. On the plus side, the engineers that survived were near the tank obstacles that they would need to clear before the reinforcements arrived. 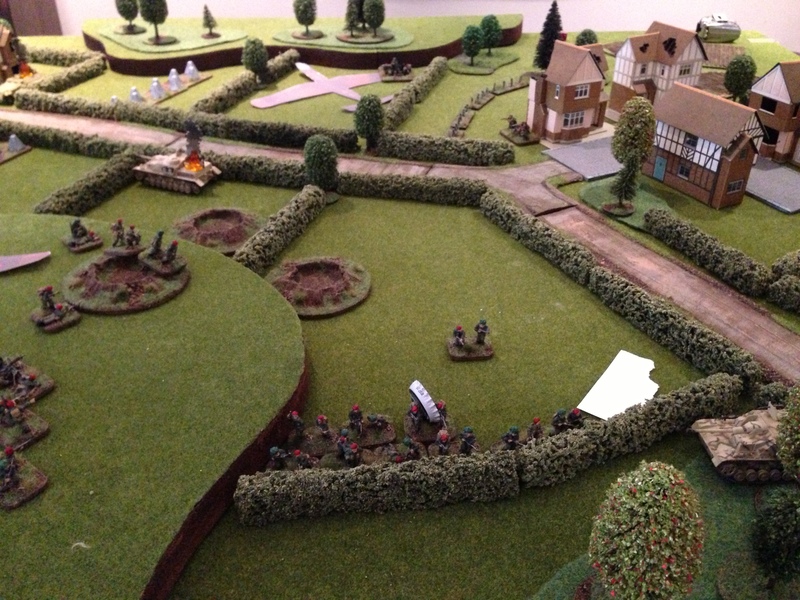 The Germans opened up on the Paras whilst they madly scrambled for cover. On the hill on the left you can see Paras making their way to the soft cover provided by the bomb craters whilst the others head to the cover of the bocage. The Paras then had the rock and a hard place choice to make – the MMG was firing on them from the village in right background whilst on the other side of the bocage the StuG waited. At this point I will draw a sad vale veil over this scene and simple note that by the time the reinforcements arrived (two Shermans and a Cromwell) the Paras had ceased to exist as a viable force. A good win to Anthony on the christening of his new wargames table (and a bloody nice combination of steaks and lamb chops mate from the BBQ). Time I grabbed my copy of World War 2 Basic Infantry Tactics for Dummies I suspect. Previous Article Wargames Illustrated – Review Subscription or Not?